Micros makes clothing that appeals to a laid-back lifestyle to keep your little boy comfortable during all his activities. Designed for beach lovers and skate pros, these clothes ollie off the fashion edge with bold and convenient style. These classic board shorts feature bold prints to combine too-cool appeal and beach-ready comfort for your little surfer's ensembles. A crisp print coats the pill-proof construction of these stretchy boys' shorts. Back pocket has either a hook and loop closure OR zipper closure (varies depending on color style) to keep items safe and secure. Drawstring front tie waistband. 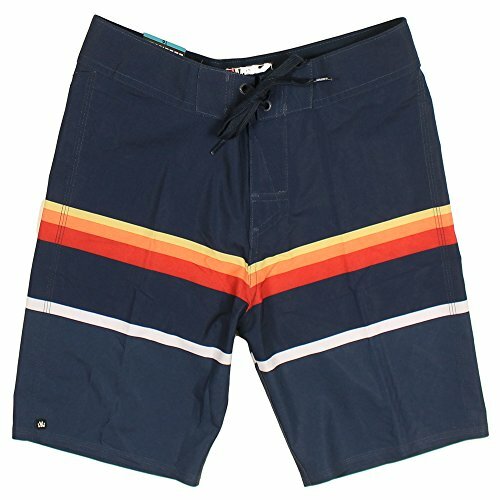 Casual, comfortable board shorts. They won't sag or stretch wear after wear. Made from quick-drying material in bold, energetic colors. If you have any questions about this product by Micros, contact us by completing and submitting the form below. If you are looking for a specif part number, please include it with your message. Boys Soul Star Shorts MELTON Stone Waist 29"